This general overview of the standard for measuring office space is to allow you to get a general idea on how office space should be measured for rental purposes. The standard has been the generally accepted method for measuring office space for many years. It should be noted that this standard can and should be used in measuring office space in old as well as new buildings. It is applicable to any architectural design or type of construction. The Usable Area is the actual occupiable area of a floor or an office suite. The amount of Usable Area on a multi-tenant floor can vary over the life of a building as corridors expand and contract and as floors are remodeled. Usable floor area is converted to Rentable Area by the use of a conversion factor (common area factor). The Usable Area of an office is computed by measuring to the finished surface side of the office side of corridor and other permanent walls, to the center of the partitions that separate the office from adjoining Usable Areas, and to the inside finished surface of the dominant portions of the permanent outer building walls. No deduction is made for columns and projections necessary to the building. The Usable Area of a floor is equal to the sum of all Usable Areas on that floor. The Floor Rentable Area is the tenant’s pro-rata portion of the entire office floor, excluding elements of the building that penetrate through the floor to areas below. The Rentable Area of a floor is fixed for the life of a building and is not affected by changes in corridor sizes and configuration. 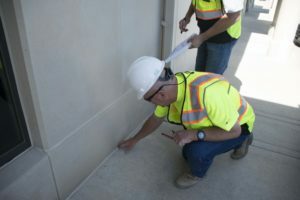 The Rentable Area of floor area is computed by measuring to the inside finished surface of the dominant portions of the permanent outer building walls, excluding any major vertical penetrations of the floor. No deduction is made for columns and projections necessary to the building. The Rentable Area of an office on the floor is computed by multiplying the Usable Area of that office by the quotient of the division of the Floor Rentable Area of the floor by the Usable Area of the floor resulting in the FR/U Ratio. The Building Common Area includes those areas of a building that are used to provide services to building tenants, but which are not included in the office area of any specific tenant. It also includes any associated common areas and is applied to the Floor Rentable Area to calculate the Rentable Area. Rent is typically paid based upon the Gross Rentable Area which includes the Floor Rentable Area plus the pro rata share of Building Common Area. The Load Factor, or R/U Ratio, is the percentage of space on a floor that is not usable plus a pro-rata share of the Building Common Area, expressed as a percent of Usable Area. It is also known as the Common Area Factor or the Loss Factor. A Typical range is 10% to 18%. That portion of the inside finished surface of the permanent outer building wall which is 50% or more of the vertical floor to ceiling dimension measured at the dominant portions. If there is no dominant portion, or if the dominant portion is not vertical, the measurement for area is to the inside finished surface of the permanent outer building wall where it intersects the finished floor.